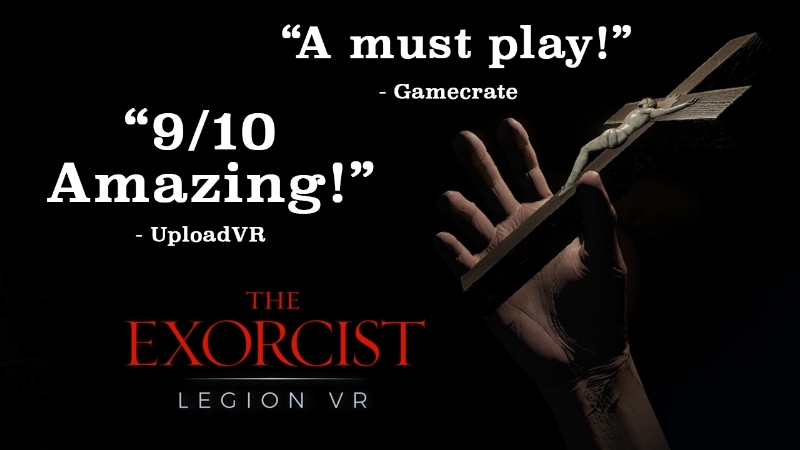 We are a bit over one week into our PlayStation release, and we're thrilled with the way The Exorcist: Legion VR is being received. Our developer, Wolf & Wood, has done an incredible job delivering a detailed and nuanced episodic adventure and we couldn't be more proud of their work. We also love seeing your tweets, Facebook messages, emails, and comments. Oh, and the YouTube videos! The community is absolutely amazing. Have you seen the Chapter 4 gameplay trailer yet? We've noticed that a few users occasionally have issues with the spatial calibration of the experience in the "training room" portion of the precinct. We're on the case! While we further optimize that process, here are a few tips you can use if you are encountering room-scale setup issues. The "footprints" are a recommended starting position but this is not set in stone. We don't require you to be in this exact position to continue playing the experience. We would suggest that on starting the calibration, move as close to the camera as possible and re-calibrate using the "OPTION/START" button on the controller. This will allow you to move the maximum amount of distance back and start in a good position to continue the rest of the experience. Don't forget, you can also move the slider when setting your height! Some people have sent us messages requesting that the "FOV blinders" be disabled, or be made optional. Those comfort features were specifically requested by Sony to prevent simulation sickness, and we were not permitted to make them optional. We certainly tried. If you use Vive or Rift headsets, you'll notice that the comfort settings are not required on those platforms. The good news is that there is almost no chance of nausea on PSVR. That being said, we recently we took your constructive comments back to Sony and have asked them to re-evaluate this mandatory feature and make it optional for those power-users who are unaffected by simulation sickness. We'll update you IF we are successful in pushing this setting through with the PlayStation team. We are also tweaking walk speed for the entire series when Chapters 4 & 5 launch. While this experience is intended to be methodically explored (take your time to discover), we definitely want to offer increased speed options for those exorcists who want to be faster on their feet. Just be warned, there are numerous things you might miss if you rush. For example, a very small minority of folks have found the Pea Soup Achievement. Trust us, it's there. Although we've spent months testing, we can't catch every single bug. If you see something that can be consistently reproduced, we'd love to hear your feedback at www.exorcistlegion.com/bugs. If you would like to be notified when we roll out the new episodes as well as the above improvements, please sign up below for our email notification list to get the news first. Sign up to receive news on Chapters 4, 5 & updates. LOS ANGELES, CA – June 19, 2018 – Fun Train, publishers of top-quality virtual reality games based on iconic cinematic franchises, announced today that The Exorcist: Legion VR is now available for PlayStation®VR from the PlayStation Store. Leveraging the power of VR, the game transports players into a chilling world created by horror maestro, William Peter Blatty, author of the Academy Award-winning Exorcist series. Through five, intense episodes (each approximately 30 minutes) players will unravel a twisted story - each one featuring a unique demonic entity that will test player’s courage and resolve. Chapter 1 – “First Rites” - Players step into the shoes of a Boston homicide detective tasked with investigating the ritualistic murder of Father Bell, a priest at a local church. It has all the makings of a serial killer, but they soon discover that it’s much more…Father Bell was on the verge of uncovering an evil entity beyond anyone’s wildest imagination. Now players must pick up where he left off, transitioning from ordinary homicide detective to full-fledged exorcist. Chapter 2 - "Idle Hands" - Explore what happens when people dabble in forces they don’t fully understand. Back at the police station, the player receives a package from a stranger directing them to investigate the sudden psychotic episode of an institutionalized school teacher who is tormented by an unseen force. The entity they encounter is as old as Babylon itself and is adept at using illusion to prevent them from severing its hold over its victim. Chapter 3 – “Skin Deep” - In this chapter players will encounter Abyzou, an entity who has been blamed for infant mortality throughout the history of civilization. Many cultures have encountered her, and she has many names - from Lilith in Hebrew to Medusa in Greek. It's the player’s task to force her to reveal herself, protect a newborn baby and send her back from whence she came! Sounds easy? Not so much- she’s quite persuasive. Chapters 1 – 3 of The Exorcist: Legion VR are available now for download from the PlayStation Store for an SRP of $6.99 each and the Complete Series (including the forthcoming Chapter 4 "Samaritan" and Chapter 5 "The Tomb") is available for $29.99. Players can purchase a Season Pass for $24.99 (Chapters 2- 4; Chapter 1 required). The Exorcist: Legion VR is compatible with Move and Dualshock controllers, allowing players to choose their preference. The game is developed by Wolf & Wood , the award-winning team behind A Chair in a Room: Greenwater and The Harbinger Trial, and is published by Fun Train. The Exorcist: Legion VR has been rated “T” for Teen by the ESRB. For more information, please visi www.exorcistlegion.com. Wolf & Wood is a UK-based development studio known for their atmospheric, standout hit, A Chair in a Room: Greenwater. Named “Best Horror Experience of 2016” by UploadVR and winner of the 2017 Viveport Community Choice Award, Wolf & Wood are expected to have their next success in The Exorcist: Legion VR. More information about Wolf & Wood can be found at www.wolfandwood.co. Fun Train is a Los Angeles-based, independently-owned publisher of episodic, premium virtual reality experiences based on established cinematic franchises. The company’s first title, The Exorcist: Legion VR, based on one of the scariest stories of all-time, launched on Oculus Rift and HTC Vive in 2017. More information about Fun Train can be found at www.funtrainvr.com. PSVR Release Date June 19th! What a splendid day for an exorcism. At long last, we're proud to announce our PlaystationVR release date. Chapters 1, 2 & 3 launch in North America & Europe on June 19th, 2018 after E3 with Asia coming a bit later. The price will be $6.99 per chapter (about the cost of a sandwich!) with further discounts if you purchase the Complete Series or the Season Pass. The release will support both Dual Shock and Move Controllers.